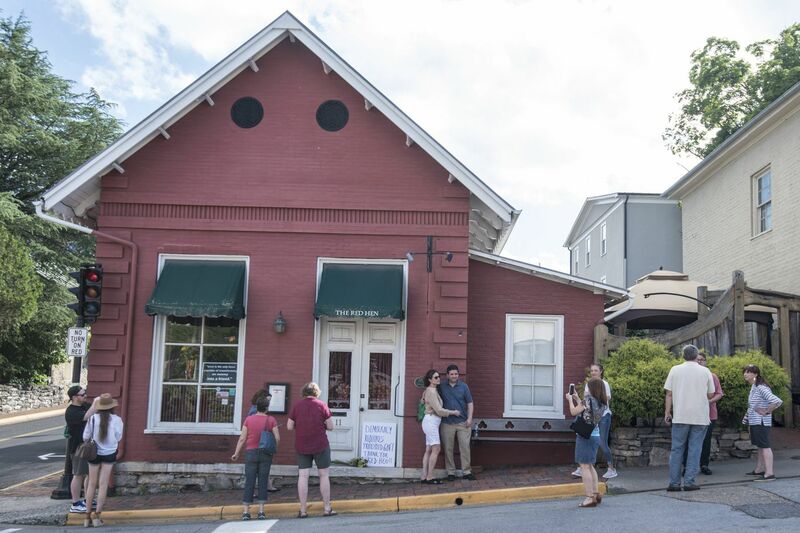 Passersby gather to take photos in front of the Red Hen Restaurant in Lexington, Va., on Saturday. White House press secretary Sarah Huckabee Sanders said Saturday in a tweet that she was booted from the Virginia restaurant because she works for President Donald Trump. I'm kind of a history buff about revolutions (big surprise, huh?) so recently I've enjoyed catching up with the great podcast series by Mike Duncan called, simply, "Revolutions." And every time — whether the setting is Paris or Berlin or Budapest, and whether it's the French Revolution or the spasms that shook Europe in 1848 or whatever — there is inevitably one similar moment. Some minister or bureaucrat — maybe sinister, maybe just hapless — is inside a government building surrounded by a large, angry, yelling mob furious over a lack of bread or an unjust tax or just a basic lack of representation. If the state functionary is lucky, he steals a janitor's outfit and sneaks out the back door and flees the country. The less fortunate often are hacked from limb to limb, or strung up from a lamppost, or both. The recent outbreak of nonviolent and sometimes quite creative protests against various Trump administration officials directly involved in the human-rights abuses taking place at the southern U.S. border — blasting a tape of a crying Central American child at the home of Homeland Security Secretary Kirstjen Nielsen, all of Broadway cheering the F-bomb that Robert De Niro launched toward President Trump, and, most famously, the turning away of Press Secretary Sarah Huckabee Sanders from that Virginia restaurant? Almost all of it falls within the bounds of offbeat civil disobedience. Need a better term? How about "Trump-shaming"? The pampered, high-six-figure-salaried Beltway elites running around clucking about "Incivility!" like the farm-to-table chicken that Sanders never got to taste Friday night are only looking at one side of the American coins that are probably jangling in their fat trouser pockets. Fine, call it incivility if you must, but why not flip the coin over to see what's making decent, everyday American citizens so angry in the first place? People are shouting at government officials in Mexican restaurants because it's the only way to get "you people" to listen — in an era when a majority of Congress can't be bothered to pass a simple bill that would ban government agents from ripping toddlers out of their mothers' arms, and when the editor of the New York Times seems to be less offended by a president who lies dozens of times than by his readers who can't understand why his newspaper won't call them "lies." The recent national conversation has reminded me of what the Rev. Dr. Martin Luther King Jr. said in 1967 when white interviewers like Mike Wallace demanded that he explain a rash of violent uprisings in Newark, Detroit, and other large cities. Dr. King condemned violence, as always, but he noted that leaders would be unwise to continue to ignore the grievances — police brutality, slumlords, lack of a political voice — that caused people to rise up in the first place. "A riot," Dr. King said, "is the language of the unheard." A half-century later, no one is rioting, but millions of Americans are again desperate to be heard. And elites still question these efforts to break the silence? How dare they! The editorial board of the Washington Post — the John Facenda-like voice of the corrupt and contented capital gang — is aghast that people who look like them and who went to the same elite universities might experience a moment of discomfort in an upscale dining establishment. In promoting its editorial, the Post described "incivility" as "a slippery slope." But the only slippery slope that I see — and the only one that editorial writers truly should be worried about — is America's current slide into a modern form of fascism. I don't feel like I need to repeat, in chapter and verse, 523 days worth of columns about the repeated human rights violations of our deportation army known as ICE, the corrupt shredding of the Emoluments Clause of the U.S. Constitution, the president's obstruction of justice and his calls for suspending the rule of law, his repeated attacks on press freedom or against companies (now, Harley-Davidson) that he personally disapproves of. The response to rising American authoritarianism has been remarkably calm: a few large protest marches, people calling — or calling out — their members of Congress, instant airport protests. But a Rubicon has now been crossed for a lot of people who heard the cries of the children and found it impossible to not take more-radical actions. The fallback argument from the civility crowd is that the one (and apparently only) way to protest an injustice in America is at the ballot box. That's absurd for a lot of reasons. For one thing, if you heard a 6-year-old girl crying in the room next door, would you wait until Nov. 6, 2018? Probably not. But the bigger problem with trying to address the American crisis every two years or so at the ballot box is that — with all credit to the New York Times' Michelle Goldberg, who got here first and probably said it better — our democracy is hopelessly broken, and in crisis. The majority of Americans feel unheard because polls are showing that more of us support impeaching Trump than support Trump — yet no one of prominence in either party in this so-called democracy is talking about impeachment. The majority of Americans feel unheard because 3 million more of us understood the dangers posed by a Trump presidency than voted for Trump on Nov. 8, 2016, yet our 18th century Rube Goldberg device called the Electoral College elevated him anyway. The majority of Americans feel unheard because our political map has become so gerrymandered that if a majority of voters go for the Democrats in November, the House still could remain in the hands of Republicans too cowed to challenge Trump's authoritarianism. The majority of Americans feel unheard because that same Congress — with a GOP Senate majority that represents a minority of America's population — used banana-republic-style tactics to steal a Supreme Court seat for their fellow right-winger Neil Gorsuch, leaving an immoral majority of justices to thwart gerrymandering reform or any other efforts that might hold American autocracy in check. The majority of Americans feel unheard because — after it became clear that neither a cowed Congress nor a timid inside-the-Beltway media understand the gravity and the danger of the current American moment — a handful of frustrated and fed-up people are airing their grievances to government officials wherever they find them (which tends to be a Mexican restaurant, for some odd reason) — and the response from those same self-satified elites is to tell them to "shut up." But the people are not going to shut up. We can't. We waited 500 long and sometimes twisted days to make sure that this wasn't our imagination, to see whether Trump and his minions were simply another failed American presidency of the kind we've seen too many times in the recent past, or whether they are the unholy heirs to the grim legacy of Europe in the 1920s and 1930s. For a lot of people, that dire question was settled with the cries of a 6-year-old. And once you're convinced that we're on that slippery slope, there can be no "civility crisis." The only crisis is silence. These pleas for "civility" from comfortable people who can relate to the horror of a shunning in a posh burrito bar but who can't put themselves in the place of tired and poor people who trekked more than 1,000 miles, only to be tossed into cages — in other words, white moderates who are more devoted to "order" than to justice — are gross and, frankly, offensive. Our basic humanity requires that we speak up and that we confront the complicit, by any nonviolent means necessary. The "more convenient season" is now. In this crisis — and this is the best way I can state this in a family publication — (bleep) civility!